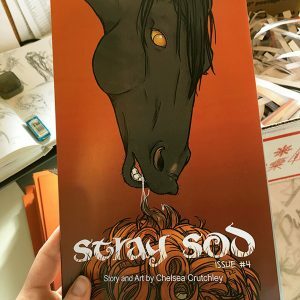 Stray Sod » Issue #4 books have arrived! Issue #4 books have arrived! As you may have seen on social media, Issue #4 is physically here! And at last my nails are in good condition for one of these shots! There’s a little added bonus in the back of this book, a look at the original drawings for the sprite-catching scene, done almost a decade ago. As always, these books will come with me first to con, and afterward will be available for purchase online. I’ll let you know as soon as they go live in the store.